Day 78 of our Cross Canada Trip. It is Monday the 1st of August 2011. We break camp in the early morning hours at Cap-Chat on the Gaspé Peninsula in the Province of Québec. We have a big day ahead of us, about 500 km on winding roads along and around the mouth of the St. Lawrence River and right through Québec City. We were hoping to take the ferry across the St. Lawrence River at Matane to Baie-Comeau. No such luck, they are booked up for the next four days... Wow, scary, that makes the BC Ferries look pretty good. Drive from Cap-Chat west bound along the St. Lawrence River. Roads are busy, but an easy drive. Highway 132 and 20 east bound are both pretty good. We had sunshine, clouds, rain, heavy rain, and did I mention rain... It is a very scenic and pretty drive (if it doesn't rain) and can be highly recommended. We cross the St. Lawrence into Québec City and the traffic is not too bad.... the TomTom GPS comes in handy, "don't leave home without it". Liz is on the phone as we are driving, but all the campgrounds in the city are booked up, it does not look good. Finally we get one camp site about half hour east of of Québec City on the north side of the St. Lawrence River. This is fine, because we want to go further east in a few days, up to the Saguenay. Our campground, Camping Plage Fortier at 1400 Chemin Lucien-Lefranzois in L'Ange-Gardin. It looks OK but pricey, $53.54. It is fairly well run, however as we are soon to find out, a whole bunch of announcements keep coming out of the loud speakers. Sounds like something out of prison camp in a war movie or from the TV show MASH. I don't have a clue what they are saying.... all sounds like French to me. The first evening everyone has a fire, and someone from the campground is driving around with a small garden tractor selling fire wood all evening. At 9:45pm we get a thunderstorm warning, and then all of a sudden at 11pm the loud speaker comes on again, announcing that it has to be quiet and all fires must be out.... you go figure, maybe we can sleep now. Next morning, Tuesday the 2nd of August we are off to Ill d'Orléans, the birth place of French America. Supposedly this is where the French first arrived in Canada. This is a wonderful friendly little Island with lots of small farms "Agro tourism", including wineries. Art galleries, bakeries, fish stores, cheese and vegetable stands everywhere. Old weathered farmers are selling Maple Syrup along the windy country roads. 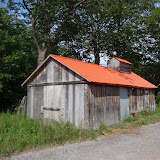 Idle sugar shacks are waiting for the winter activities when the sap of the maple trees are cooked into delicious syrup and people gather to enjoy warm local delicacies. Now in summer, we tasted wine, cider, fish, strawberries, raspberries, blueberries, chocolate and more. Louise Lasnier studio - gallery. A must see. We visited some great art galleries and especially liked the work of Louise Lasnier. Great Day! For more pictures from this part off our trip, click the picture below or go directly to the slide show here.